Well, folks, we had a fascinating Facebook conversation with Senator Bryan Townsend today, started off by one of his constituents asking simply "Where's the Route 4 park?". We have repeated on numerous occasions, and in articles on this website, that both State Legislators (including Rep Ed Osienski) are equally at fault for the loss of the Orphanage Property. Unlike other States, most of Delaware does not have local jurisdiction, like a city, township or borough. Nor do we have the ability to draft and put up referendums on the ballot, i.e. open space funding via a minuscule sin tax as commonly seen in most other States. This is something that, like 10-9 funding (failed) and Open Space as a Democrat Party Plank (failed), we would have worked very hard on to secure funding. Therefore, our County and State Legislators are given a significantly elevated responsibility to act in the people's best interests, throughout the districts they serve. We knew from very early on that Councilwoman Lisa Diller was completely useless; a colossal failure who did virtually nothing for STOP. Exec Meyer arrived late on the scene with his election in 2016, and with no State Legislator oversight, simply threw away this one time-only opportunity. But along with Diller, both Rep Ed Osienski and Sen Bryan Townsend knew way back in 2013 that the property was under the threat of development, and did not act in the manner one would expect if you're trying to save it. AC (Ange Connolly, STOP): Unfortunately, you did not ... starting with keeping it from the public for several years when that precious time would certainly have made a difference. BT: Ange, no one kept anything from the public. In particular, residents who attend their community meetings heard from us about what limited information we did have. FW (Frank Warnock, STOP): Please stop lying, Bryan. How come everyone in Kowalko's district -- and those beyond like us -- knew immediately when 8 acres of habitat came under threat? You and Ed did virtually nothing to inform the public and notify advocates and community leaders from 2013-2015. 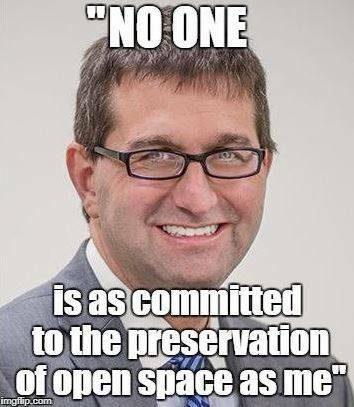 FW: You also did not even float the idea of eminent domain, or getting the governor involved. You also stood idly by and allowed a huge window to close while Meyer farted around even coming on a tour of the property with us. BT: Frank, we did lobby the Governor, whose team did speak with County officials. We did not allow a window to close; we secured State funding at a time when County had indicated funding was the threshold issue. I was keeping you posted throughout that whole time period, with a consistent combo of phone calls, emails, and in-person meetings. In my grief over failing to save the property, I remember vividly who fought for the property and who didn’t; in your grief, you seem to have forgotten. FW: Why didn't the Governor, and you, and Ed, and Sen Sokola, and Rep. Paul Baumbach, and a host of others that were supposedly on board override Meyer? The State has the ultimate authority and can do so -- even if it requires Eminent Domain. You could have demanded this, and/or threatened to resign over it. Your constituents should come first, above your own self-interests. BT: Frank, it wasn't possible to "override" Meyer or the County, particularly once state legislative session was over. Remember, everyone thought it was a 50-50 partnership, and the key step was getting enough funding to have the Sisters take the State/County seriously and finalize an agreement. We were able to get State funding, and that should have started the dominoes falling in a positive direction. But when it didn't (because of County tactics and decisions), it wasn't possible for the State to go back and re-do the framework. We were done with legislative session until January 2018. Now, of course, in hindsight, we wish we had seen what might happen with the County, and tried to come up with a work-around where the State would be the 100% purchaser. But we never thought the County would so dramatically fail on this project. Four other quick points: (1) the State may have the ultimate legal authority **generally**, but it would take a long time, if at all, to somehow change the law and take parks/land-use power back from the County... it simply does not work that way, especially snap-of-the-finger timing and especially when the legislature is not in session; (2) Eminent Domain has never been used in the way you are suggestion, and in fact DNREC's own law in the Delaware Code forbids this kind of acquisition via eminent domain; (3) you keep saying that we should have "threatened to resign" when County wasn't cooperating --- that is entirely childish behavior, and no one, no one, no one at County would have cared if two state legislators were threatening to resign for not getting what we wanted... in fact, resigning (or losing re-election) would be what those individuals might want to see, because then they would not have to worry about disagreeing with us anymore; (4) I put my constituents first, always, including on this project... there were no "self-interests" for me that distracted me from 100% supporting this project, including convincing my State colleagues to allocate funding... and I clearly remember the many, many times you and I communicated about this issue in real-time, and the times I literally handed my newborn son back to my exhausted wife so I could hop on yet another phone call to try and broker a successful deal here, to try and do everything possible to make that land a regional park for a hard-working community that deserves it... in those final weeks, you and I coordinated frequently, and it is unfortunate that we were not successful, and that you now are on a path where you lump those of who stepped up into the same categories as those who did not. FW: You will never, ever convince us, Bryan. If a giant sinkhole opened up on Rt.4 in front of the Orphanage Property, the State would have immediately found $7+M to fix it. Ditto with a bridge collapse, or an emergency need for land in any other situation. They found $30M to buy out Glenville. The money is always there when something is this important, as this was, and there is lots of precedent for it. The Bond Bill can be amended in any emergency, or sought after for emergency funding if required. The point is, this wasn't an emergency to you or Ed. To us it was. That is the difference between us and that will never change. And no, I would have told my colleagues on the bond committee and in Leg Hall that this is of incredible importance and that your political career is on the line (we obviously hope it is now). You could have stated you would be forced to consider resignation given the political fallout, because yes, the constituents come first. You never once told us you spoke with Gov Carney and what actions he was taking, so as far as STOP is concerned, that is hearsay, but we'll gladly look at any emails between you two if you have them. The fact -- if true -- that eminent domain wouldn't work, and that overruling the County would take too long; that's not our problem. You're the State Senator and speak for the State, as does Ed, and again, if true, that is a colossal failure on the part of State Govt. Again, in virtually any other emergency funding situation, your excuses would have no merit -- the money would be there. BT: Frank, I’m sorry that you seem to forget that State money was there, and that our previously announced County partner decided not to prioritize the project in the final critical days and weeks. In your anger, you’re pointing to inapplicable or untimely theories (like eminent domain against a willing seller) and blaming all officials, even those who actually fought for the project. It’s your right to do so, and your right to advocate for other candidates at election time, but it’s unfortunate to see you ignore the clear record of advocacy, the fellowship that had been built, and the need to hold accountable those people who did not try their best. FW: The money wasn't there. Only $1.25M is not $6M. Many even believe that the 1.25 was only put there as a decoy; a CYA. Something for you and Ed to be able to point to, and say "see? we tried". Again, had this been any other pressing need for State land acquisition, the money would have been there. It always is. Just give the word and we will start researching the vast amounts of precedent for emergency bond/budget funding and start posting on it. STOP more than qualified. You can blame Exec Meyer and NCC, but with plenty of recourse at your disposal, you and Rep. Ed Osienski failed. Period. Either your donors came first, or it just wasn't important enough. You had yourself convinced that even if it was hot button, you would survive the fallout -- and you just might given your ability to deflect blame and put it on others very convincingly. The Sisters were the willing seller. Sipple acquiring it was the point it was presumed not [for sale]. There is tons of precedent for eminent domain being used in numerous contexts. It would have been very appropriate at the point that Meyer failed and the land was presumed locked in for development. You should know this; you are an attorney. FW: Have you even spoken with Sipple, to ask if a price tag may just exist for buying it now? Nothing is built yet; it appears the land is being prepped and they might just start the low income housing first. Is there a price -- say, $9+M, that Sipple would accept to halt work and sell beyond the low income housing? The State discovered hundreds of millions in surplus this year. The price difference would be virtually negligible in comparison. Oh wait, we forgot -- it's going to be spent on men taking months off from work on maternal leave. That is just soooo much more important than saving our natural environment and quality of life, right there with fighting lead paint chips. Nice! FW: BT said: "It wasn't possible to "override" Meyer or the County, particularly once state legislative session was over." This is completely absurd, and if true, then the State needs to re-write its laws of governance. What happens when other crisis' arise, and "the legislative session is over?" What happens when any other emergency funding authorization is needed during this time? What if there was any other emergency, and they had to vote on something during this time? Is everyone just SOL, even left to die in an extreme case, just because "the legislative session is over?" That argument is a complete non-starter, Bryan. And yes, Meyer could have been over-ridden, if from no one else, the Gov's office. If he can't, then NCC is autonomous and what's the point in having the State? What good are you, then? NCC's laws of governance are even written and applied from the State's code, and that tells anyone with a brain who has ultimate authority and veto power in extreme circumstances at least. FW: BT said: "DNREC's own law in the Delaware Code forbids this kind of acquisition via eminent domain"
We sincerely appreciate Sen Townsend's polite decorum in this discussion and on his page in general. However, his acute ignorance and denial of how the Govt operates (and/or should operate) in terms of priority and jurisdiction is sad and troubling. 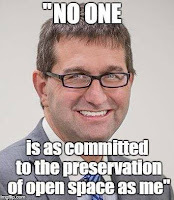 Saving the Orphanage Property was anything but impossible from the State side -- either through emergency legislative intervention in Exec Meyer's flubbing of the buyout, or the State going it alone via eminent domain or emergency provisions in the Bond Bill. None of this is without precedent. Yet there is nothing more Townsend would like right now than to "move on" from STOP and hope it fades from memory. That simply isn't possible and Advocates and Constituents alike will continue to remind him of that for the duration of his political career. I still say, "Hogwash." I will repeat my question, "Where's the Rt.4 park?"